Conor McGregor was in negotiations for a fight against Donald “Cowboy” Cerrone in July until talks fell apart when he declined a co-main event spot on the card. It appeared that the high-profile lightweight showdown was all but a done deal after both McGregor and Cerrone exchanged messages on Twitter with anticipation growing towards the eventual clash. Then suddenly UFC president Dana White said the fight was likely no longer happening and Cerrone got booked into a different matchup against Al Iaquinta in the main event for the upcoming UFC Fight Night card in Ottawa on May 4. The reason for the shift came because McGregor didn’t want to serve as the co-main event on a card where he would undoubtedly be the biggest draw whether he was fighting for a title or not. 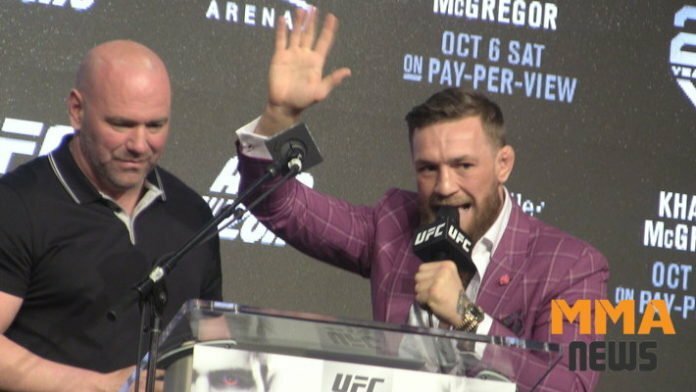 Now White has confirmed that was exactly the problem as the promotion attempted to book McGregor on the upcoming UFC 239 card in July as part of International Fight Week 2019. “Yes, that did happen. Every time I deal with Conor, there’s always something. There’s always something to deal with and we get it figured out,” White told the Barstool Sports “My Mom’s Basement” podcast this week. The heavyweight title fight would obviously involve current champion Daniel Cormier and the fight that he’s been pursuing is a showdown against current WWE superstar Brock Lesnar. Obviously that fight wasn’t a done deal, although White has said recently that he would like to see Lesnar return in the summer after his obligations to World Wrestling Entertainment were wrapped up. It seems that was definitely the plan for July with White now confirming plans for a heavyweight title fight as the targeted headliner for UFC 239. White believes he would have received a ton of blowback for putting McGregor atop that card with Cormier’s heavyweight title defense as the co-main event. “The more people I hear from, the fans and the media and all this s—t, if I end up putting Conor McGregor not as a champion on the main event, I guess I don’t have to listen to any bulls—t do I?” White stated. Obviously the deal never came together and then McGregor abruptly announced his retirement from fighting on late Monday night. McGregor had said he was ‘in talks’ for a fight in July, which would have likely landed him on that UFC 238 card in Las Vegas. It remains uncertain if a breakdown in negotiations regarding his return is what ultimately led to McGregor saying he is calling it a career. As of now no official decisions have been made regarding UFC 239 but McGregor’s future in the sport now seems a bit cloudier after saying that he’s decided to retire.